This is approximately the thinking that three years ago started the journey that culminated in the birth of UNA. We thought, as most companies do in this day and age, that we must have “some values”. And, so we created “some values”. We sat in a meeting room, the entire company, at one of our all-company meetings aptly named Round Tables, and we decided on “some values” we liked, and we launched them. All good we thought. We did good. We had values now. The not-so-good part was that no-one really used them, and now three years later I can’t even remember them. They were, in retrospect, empty words better suited to be hung on walls like trophies but never actually to be used. After a year’s time we realized that we needed to redo the whole process. So, we started anew, from scratch, and this time we looked inside ourselves to find who we are and who we aspire to be – in light of our Norwegian heritage. Norway, as with the rest of the Nordics, is a society based on the principles of having the trust and transparency to both take quick and independent decisions and to have fun. No wonder Norway is both one of the happiest and most productive countries in the world. This was the catalyst of a passionate discussion that eventually ended in the five values displayed below. Values we did believe in. And as we were still deadly afraid of trophy values hung on walls, we decided to have them be visual icons that would be immediately recognizable and that we could use in our day-to-day communication – and even in Slack as emojis. This worked extremely well, and the values now finally meant something to the good people at Unacast and were, because of that, being used more and more. We now had the cultural Norwegian core we had wanted to build our company upon globally. Read more on each of the five below. Everyone at Unacast can and is expected to take charge of their own situation, and make sure the company as a whole move forward. Waiting for some feedback? Go get it! Want something done? Do it! Every day can and should be meaningful, and something that pushes things forward. To give the little extra each day makes a huge difference - at the job, and also at home. Experience the moment. Dare to be vulnerable and show yourself, your team and our partners who you really are. The trust we build through transparency will help to lift us all higher than we can rise alone. The promises we give each other and the swift follow-ups that others are dependent on are the lifeblood in the veins of Unacast. We take responsibility and deliver what is agreed. Always. Create an unexpected moment that surprises and delights team members and partners. Everyone needs fun in their life, especially while doing something important. After living with and being guided by these five values, in everything from hiring to product development, for about a year or so, we concluded that “Every day counts” and “Keep the wheels turning” where too alike and were used to describe the same traits, and so we removed the latter. You could almost call it a natural Darwinist evolvement. We were now left with four values. After another year the value “Be your own CEO” had grown in importance to also include the value of “Every day counts”, so we removed that one too. We were down to three values and we liked how we over time could synthesize what we believed into less and less values. We believed, and still believe, it to be a healthy sign for a company. With three values forming the core of the company, we decided to redesign them to have a clearer and cleaner expression (plus more professional), and note that we at this point also removed the descriptions below each icon. The visuals and icons were so institutionalized that the text portion of them was no longer needed. Another healthy sign. As we looked at these new, purely visual, values next to each other, something dawned upon us: They fit extremely well together! What if we combined these three into one? And so we did. Thus, UNA was born – the embodiment and culmination of a three-year journey through the valley of values. 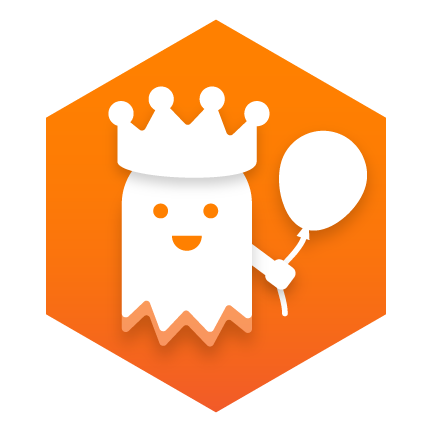 UNA is a transparent (symbolized by the ghost) CEO (symbolized by the crown) having fun (symbolized by the balloon). All the things we wanted to bring with us from the Norwegian cradle from where Unacast was born. Our journey had led us to something that is truly ours and truly us. It’s no longer “only” a value, or a set of values. UNA is us and we can’t wait to see where we the journey will take us from here – together with UNA.